It is not easy to travel using wheelchairs on rough ground surfaces that are prevalent in under-resourced settings. In order to improve wheelchair designs used in such environments, evaluating wheelchairs in similar conditions to the setting of use is essential. However, testing wheelchairs on outdoor rough surfaces may produce inconsistent results due to different weather conditions, terrains and ground cover. For consistent evaluations and comparisons, tests should be conducted on the surfaces with quantifiable and repeatable roughness. We have developed Modular Rough Surface Units (MRSUs) that can generate standardized surface roughness. The standardized surface roughness for wheelchairs was originally quantified by Duvall and colleagues (2013)(*1) as "roughness index" expressed as the ratio of accumulated vertical displacement of a wheelchair caster for a given horizontal traveling distance. MRSUs for a specific roughness index can be built using slats, PVC pipes and rubber strips. In Wheels Project, MRSUs with roughness index of 1.36 in/ft have been built (Sasaki and Rispin, 2017)(*2). 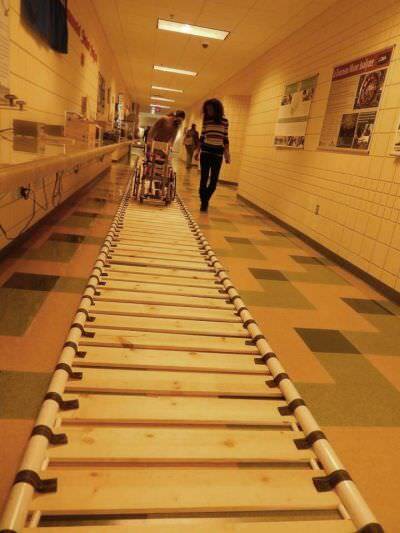 Each MRSU weighs only 55 lbs (10 feet in length) and can be easily carried by two people and linked together using duct tape to make a rough pathway. When not in use, the set of units is compactly stored in a vertical position requiring only a ten-square foot floor space and held together using elastic cords. (*2) Sasaki, K. and Rispin, K. (2017). Assessment of physiological performance and perception of pushing different wheelchairs on indoor modular units simulating a surface roughness often encountered in under-resourced settings. Assistive Technology, 29(4): 173-180.